As professional sports leagues and the athletes they employ garner a higher public profile, there have been increasing demands, from media, lawmakers and the public that they be held to a higher standard of conduct. Athletes have come under greater scrutiny, both on and off the playing surface, with each instance of misbehavior sparking a greater outcry than the last. However, is there a public good served by publicly vilifying athletes for off-the-field or off-the-court indiscretions? Moreover, do professional sports leagues, like the NFL, have the competence or right to impose punishment on players in response to public outcry, either before the player has had his day in a court of law, or after the courts have decided not to pursue criminal charges? 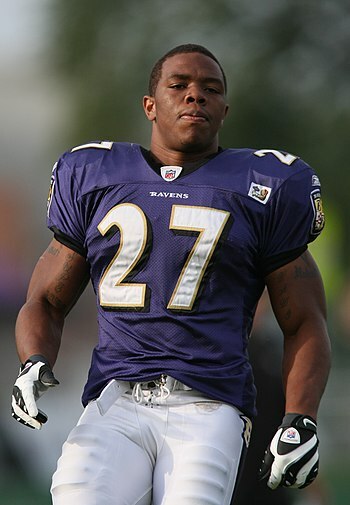 Two recent cases of note involve former Baltimore Ravens wide receiver Ray Rice and Minnesota Vikings running back Adrian Peterson. Rice was arrested earlier this year for allegedly punching his then fiancee unconscious at an Atlantic City casino. A New Jersey grand jury indicted Rice on a charge of aggravated assault, which carries a penalty of up to five years in prison. The charge was later dropped when Rice agreed to enter court-supervised counseling, and he eventually married his fiancée, the alleged victim in the case. Despite the decision of the courts, the media outcry continued, and NFL commissioner Roger Goodell responded by levying a two-game suspension against Rice, just days before a TMZ video of the assault was made public. Furthermore, as the betting would suggest, the video stoked further outrage, putting Goodell in the uncomfortable position of exacting harsh punishment on a player for non-football related offenses that a court of law deemed not severe enough to bring to trial. Goodell dropped the hammer on Rice, suspending him indefinitely, while the Ravens terminated his contract, likely ending his NFL career. In Peterson’s case, the 2012 NFL MVP was recently suspended by the Vikings following his indictment by a Texas grand jury on charges of reckless or negligent injury to a child. Peterson did not deny the allegations, explaining that he applied the same method of discipline on his son that had been applied to him as a boy. While it is understandable that the public is shocked by such actions, demands for the NFL to act where the courts have not place a burden on the NFL that it is simply not capable of carrying. The NFL is a private enterprise that exists for the primary and legitimate purpose of making money. It lacks the experience, competence, and mandate to exact justice fairly and in accordance with the law. While fists have been shaken at the NFL’s perceived bumbling of the Rice case, a surprising modicum of outrage has been directed towards the New Jersey court that chose to drop the charges against Rice. Adrian Peterson has received little to no benefit of doubt prior to getting his day in court. NFL players have been arrested at a rate of approximately one per week in 2014, and we’ve witnessed no shortage of high-profile college football players who have faced charges that were conveniently made to disappear. It’s a worrisome trend for every member of society, whether he or she is a football fan or not. However, such offenses are best addressed in court—where the accused player both answers to the law and is protected by it. If the courts don’t punish a player for alleged offenses, the commissioner of the NFL cannot do it for them, no matter how vociferous the howls of media outrage become. For that woman out there whose husband or boyfriend is beating you, I pray that you will contact the police and let them know what is going on. Women, you are too precious and beautiful to allow a man to beat you. Of course, I understand that women do beat men, but this piece is devoted to women, who are unquestionably the greatest victims of physical and emotional abuse. A man does not have to physically hit you for it to be abuse. The most damaging abuse is emotional abuse because it can be more difficult to overcome. If your man is emotionally abusing you, please get out of the relationship with him. I have seen too many men who emotionally abuse their women and do not see the tremendously violence that they are doing to them. You don’t own these women! When a man emotionally and physically abuses a woman, he is simply a coward. Why don’t you step to another man and try to do the same thing? If you need someone to pick on, I am always available! For men who are friends with other men who abuse their women, you guys need to be real men and stop them from beating on their women. About three months ago, I had a conversation with a guy in Madison, Wisconsin who believes it is not another man’s place to try to intervene in another man’s relationship with his woman when there is some question about whether the man is abusing the woman. I let him know I disagreed with him very much. I think it is always best to err on the side of life and on the side of protecting our women from harm. I have some strong feelings that a man I know in Madison, Wisconsin is emotionally and/or physically abusing his wife. I have to admit that I don’t care too much for the lady’s husband anyway, but I do love the sweet personality of the man’s wife. I’m going to get this man arrested and put in jail because I am a mastermind and am going to prove he is beating his wife. He thinks he has been getting away with it, but I am going to bring him down! I want women to start rising up against domestic violence. In your efforts to rise up against domestic violence, I want you to be more concerned about not being emotionally and physically abusive to men too. Women must form partnerships to combat domestic violence because most cases of domestic violence go unreported. I refuse to sit on the sidelines and watch the women in my environment continue to be victimized by abusive men. I will lead an effort and movement to see that any man who hits a woman ends up in jail for a long time. Keep your hands off these women! Stop raising your voices and screaming at these women trying to intimidate them—this is emotional abuse. If you are a man and you feel the need to raise your voice at a woman and scream at her, please forget about yelling at her and come scream at me. I got the cure for all that screaming! Women, when these men start yelling at you trying to intimidate you, call the police on them. Now, I am not telling you to do trifling stuff like call the police on men just to try to make them mad, but I want you to call the police on men who are legitimately trying to intimidate you and who have a strong possibility of putting their hands on you in a violent way.